We have read about this around the web and here is what is going on. There are reports of people who say they went to Walmart or Menards or Home depot to the nursery section and they found salvia plants or salvia seeds. While this may be true that they had Salvia there, it is NOT Salvia Divinorum. Basically it breaks down like this: Salvia Divinorum translates into Diviners Sage. So Salvia is just another word for SAGE. So they may have the type of sage you would grow in order to season a chicken, or that flowers to decorate your patio, but they do not carry the magical Salvia Divinorum. When cutting a stem from a healthy plant, use a clean, sharp blade.Make the cut below a node. Your cutting should have at least two nodes and be approximately four inches in length. A node is the joint that leaves grow from. You should remove the leaves from the bottom node of your cutting and put it in water that has been sterilized. 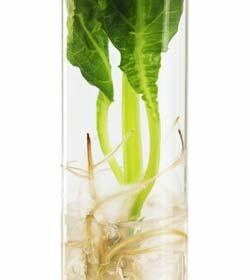 Rooting can take as long as six weeks. If the temperature is warm, rooting can take place sooner. 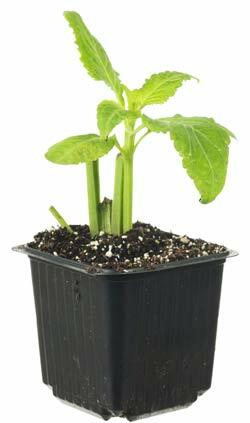 When the roots are about an inch long, the cutting can be planted in a good quality potting soil. It is recommended that your salvia divinorum plants get a minimum of 12 hours and a maximum of 18 hours of light in every 24 hour period. It really isn’t necessary to purchase expensive grow lights; as natural or fluorescent light is fine. One caution, if you are growing your plants in natural light, do not grow them in direct hot sunlight. It can warp the leaves. If you decide to use fluorescent lights, hang them approximately one foot above the plants. When your plants start growing, they can become root bound. When this happens, you will need to re-pot them. You can use normal potting soil and it is suggested that you put a layer of gravel in the bottom of the pot for drainage. A mature plant, ready for processing, can get several yards tall.